We love Barcelona it’s one of my favourite cities in Europe. We have been lucky enough to visit Barcelona twice now and it is a city that does not stop surprising you. It is always bustling with locals and tourists alike. Everywhere you look there is something amazing and unique. I read somewhere that the biggest mistake you can make when you visit Barcelona is not to look upwards and unfortunately I read this after we had already visited the first time. The second time I made sure I remembered this and I was stunned at what I had missed. From ground level all the way to the sky, there is always something to look at in Barcelona with kids. After booking our air ticket we set about finding things to do in Barcelona with kids. Is Barcelona the best place to go in Spain with kids? When in Barcelona we choose to stay at Casa Consell Guesthouse. It was close to the city centre, had great public transport links, was fully self-contained. You could cook, do your washing and relax with TV and Wifi. Why look any further for great affordable family accommodation in Barcelona. 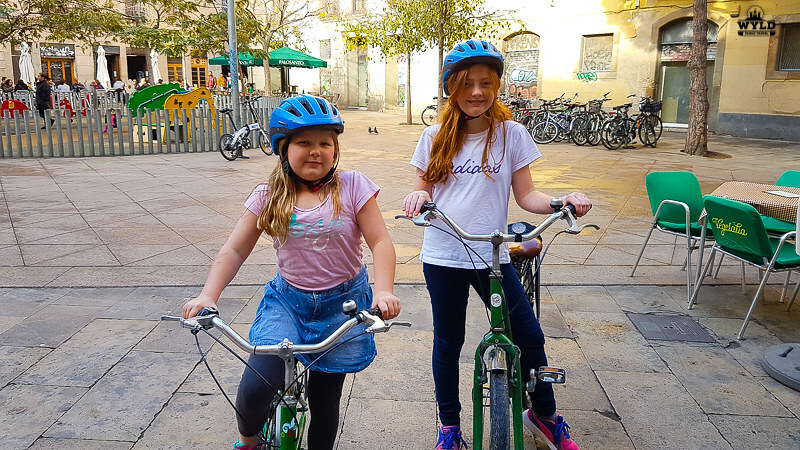 We went on a bike tour through the streets of Barcelona and it was a fantastic way to see Barcelona with kids. On a bike tour in Barcelona, we were showed the Gothic and El Born quarters of the city (They are two of the most interesting places to stay in Barcelona). While biking in Barcelona our tour headed down to Barcelonetta to cruise along the wide bike and pedestrian paths that line the coast. Barcelona is extremely bike friendly with bike lanes on even the busiest of the streets that criss-cross the city. This is a great family-friendly tour for kids in Barcelona. Another option is bike rental Barcelona and does it at your own pace. Our girls loved the bike tour. Barcelona is the perfect urban area to explore by bicycle. Ride along narrow and twisted streets, pass stunning buildings and admire unexpected hidden gems in the heart of the city on this 3-hour private tour. Your guide will take you into the old city, where you’ll see more of the monuments and attractions that would be possible on foot. The Barcelona Port cable car cable car runs from Barceloneta to the Montjuic station. You can get on the cable car at either end. The trip across takes 8 minutes. The cable car dates back to 1929. The red and white cabins can accommodate 20 people and crosses the port at a height of between 70 and 90 metres. The cable car provides amazing views of the Mediterranean coastline and it is a great thing to do in Barcelona for kids! Our kids loved the Barcelona Port cable car. The beaches at Barcelona were transformed for the 1992 Olympic games. Nowadays there are many sandy beaches that are great for swimming. The calm waters of the Mediterranean are perfect for kids and parents alike. A great family day out in Barcelona. You will usually find showers along the beach to wash off the salt water at the end of your day. There are so many families that make their way down to the beach on a warm day in Barcelona that your kids will find a friend or two! Which Barcelona Metro lines stop near Barcelona Beach? Which Barcelona Train lines stop near Barcelona Beach? Which do Barcelona Bus lines stop near Barcelona Beach? What are the closest stations to Barcelona Beach? The Barcelona Card allows you to explore and discover the city at your leisure with a whole host of advantages and free public transport! The Barcelona Card comes with a guidebook in 6 languages (Catalan, Spanish, English, French, German, and Italian) that details the places to check out and the discounts and free offers available. You’ll also receive a general map of Barcelona that shows where discounts and free offers can be found, as well as a map of the Metro. Located just outside Barcelona is the newest biggest attraction on the Catalan landscape, Ferrari land Barcelona. Located at Port Aventure along with another theme park and water park Ferrari Land fits right in. Ferrari Land is over 70,000 square meters of fun and adrenaline. Barcelona Ferrari Land features 5 great rides especially for the kids who are not quite ready to take on the full paced attractions. For the more adventurous kids and teenagers, the park has 16 full paced rides to try out. The fastest is the Red Force clocking in at speeds of 180 kilometres an hour. Like all big-ticket attraction parks, there is shops, restaurants and stage shows for you to experience. Access PortAventura World from the A-7. Enter your starting point here and follow the directions to arrive at the resort in the easiest possible way. Barcelona is a large city with many sites spread out all around the city. To use public transport to reach all the sites from the beach to Mount Juric from Park Güell to the famous La Rambla market requires lots of planning. Take the worry out of that especially if you’re in Barcelona with toddlers. Jump on the Barcelona hop on hop off bus and see the sites while stopping and visiting the ones that suit you. This is hands down one of the best things to do in Barcelona with kids. The kids get to ride the doubledecker bus, there is little walking involved and the whole family get to see the sights of Barcelona. It is such a smart way for your family to see Barcelona easily without navigating the metro system. This might just be the best way for a family day out in Barcelona.It is definitely one of the easiest family-friendly tours of Barcelona to do. Discover Barcelona at your own pace on a double-decker hop-on-hop-off bus tour! One convenient ticket is valid for two routes, each with stops at the best sites in Barcelona! A complimentary map and guide with the routes and stops will help you choose where to get off and where to stay on. You will also enjoy audio commentary in 12 different languages. It is the ultimate way to travel Barcelona with kids. We went for a short 1.5-hour cruise on Barcelona Harbour with Las Golondrinas. The cruise showed you around the harbour from places where cruise ships dock to where container ships unload. We made our way out of the harbour briefly into the calm waters of the Mediterranean sea. Both the girls loved the boat, we enjoyed the sun, the calm waters and cold drink onboard. This was one of our favourite things to do with for kids in Barcelona. 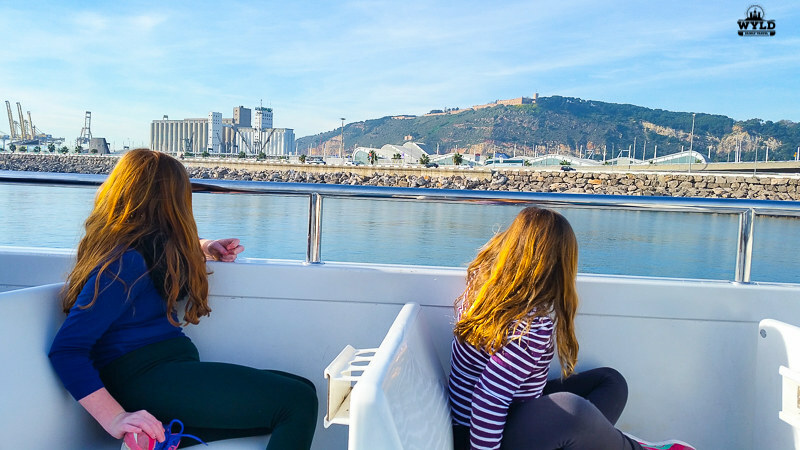 Climb aboard the historic Las Golondrinas pleasure boat for a 90-minute cruise around the harbour and seafront of Barcelona, following a 125-year-old tradition. Las Golondrinas began its adventure in 1888, at the same time as the Barcelona Universal Exhibition, the completion of La Rambla, and the construction of the Columbus Monument. Looking for a unique view of things to see in Barcelona. A Barcelona Port cruise is a great experience. Being by the sea fresh seafood is on the menu at many places throughout Barcelona. One of the favourite dishes is seafood Paella. To find one of the best Paella’s in Barcelona head to O’Toxo Tres Hermanos. It is located a few hundred meters off La Rambla. O’Toxo is a traditional Barcelona restaurant and it is where you will find, without a doubt, some of the best Tapas and Paella in the city. We can recommend this restaurant as we ate here 4 times during when visiting Barcelona. The seafood and chicken/seafood paella is a must. Do not buy the Paella on La Rambla you will only get the mass-produced version that comes frozen in a box. O’Toxo offers the real deal cooked from scratch while you wait. Nothing better than some cod cake tapas and paella washed down by some Sangria! 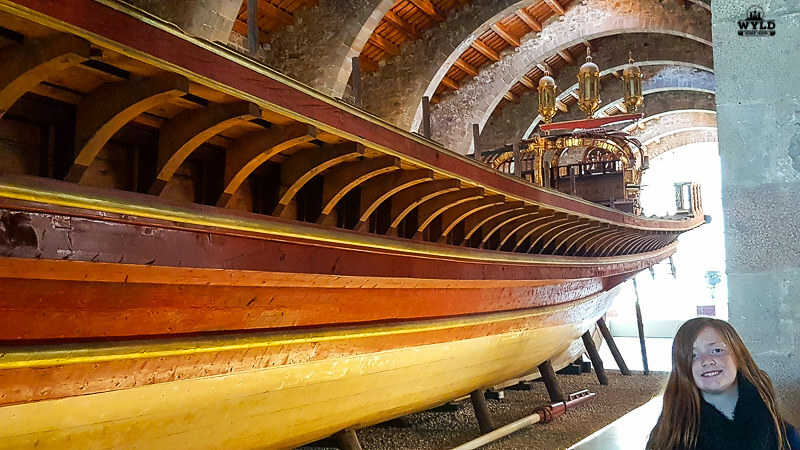 Museums are great family attractions and the Maritime Museum is one of the best Barcelona family activities. The Maritime Museum is located just off the bottom of La Rambla near the Marina. The museum has plenty of displays from toy boats through the ages to a full-sized Gallion which absolutely amazed us all. Talk about a kid-friendly museum in Barcelona this is it. Displays include a wooden submarine through to model cruise liners that sailed the Atlantic out of Barcelona. There are also video presentations that are displayed on the sides of the shipping containers that are located in one section of the display. Multimedia displays such as this are a great attraction for kids in Barcelona. They are spoken in Spanish but there are English subtitles. Just to be able to see the full-size replica of a Spanish Gallion makes this a must do in Barcelona. 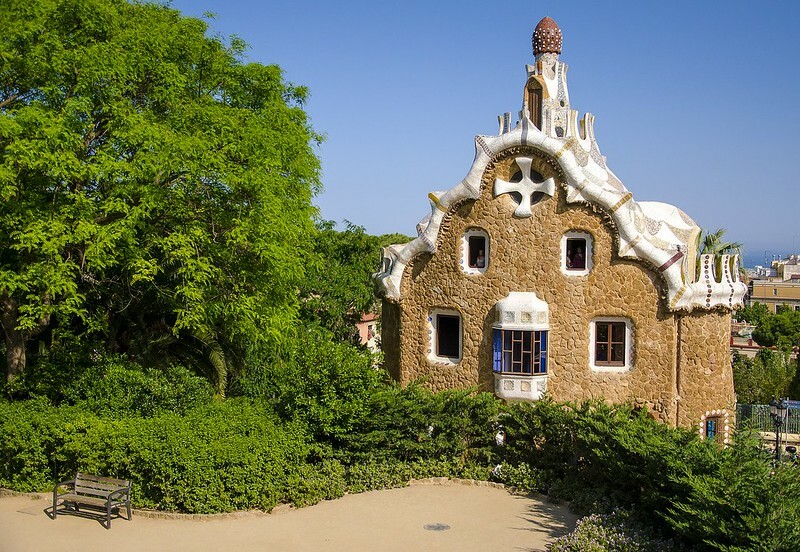 Gaudi Park is one of the kid-friendly museums in Barcelona. Its outdoors with plenty of room for kids. The girls loved all the different colours of Gaudi Park. They loved the red cliffs that all had a gorgeous purple bougainvillaea growing up the top. All of the mosaics that seemed to be everywhere and all the little houses. They loved walking and looking down over the park. We accessed Park Guell via the Hop on hop off bus tour with kids in Barcelona. Now, this can be a kids dream and a parent’s worst nightmare. The lolly stalls in here are some of the most colourful you will ever see and they have everything a kid could ever want! (And just quietly a sugar lover too!) If lollies are not your thing then you can’t go past a juice or the fruit stands. They are just as magnificent and as colourful as the lolly stands. If you need it you will find it there. It is a market aimed at tourists so you must be very careful of pickpockets while you are there but it is worth a look. If you are staying for a little while in Barcelona with a family try and find a local market right near you. You will find it much cheaper and just as beautiful. Go on a fun appealing adventure and discovery tour of Barcelona with your children. Mind you this is fun for the whole family. Search for hidden dragons and learn about their significance to Barcelona with a map and clues. The tour begins in the Born district and you will be asked to find the answers to questions like why half a house stands nearby or so many geese live by an abbey, as you play the game. The guides are very knowledgeable and multi-lingual. Take a walk through culture, history and heritage of the 'old town' Barcelona with kids in a fun way! This tour is amazing when in Barcelona with older kids. Don't miss out on this Fun family Dragon tour. Go on a discovery tour of Barcelona with your children. Uncover the hidden dragons and their special significance to the city with a map, compass and a few riddles. This list provides you with some essentials to pack for Barcelona. We have filled the list with live links to make shopping for some of these items much easier. Barcelona in the summer is very hot while in the winter its mild by European standards. 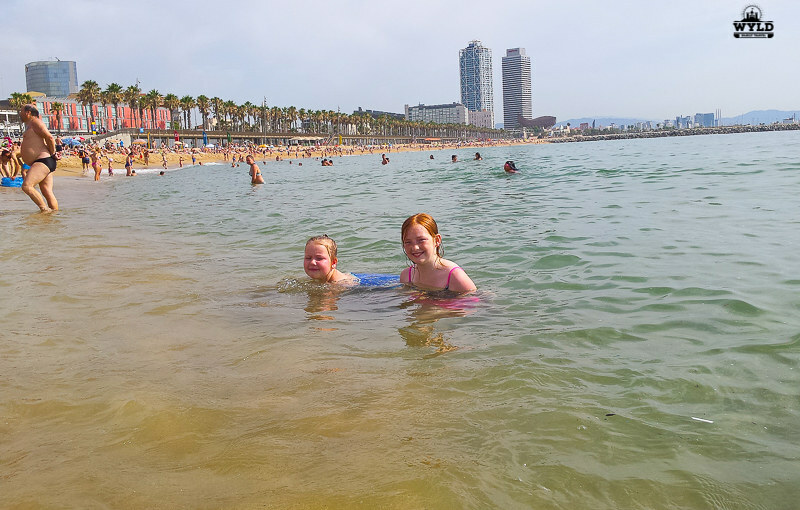 We hope this article provides you with some great inspiration for things to do in Barcelona with kids If you have had enough of kids stuff you will find plenty to do inside and outside of Barcelona. There are some amazing galleries and restaurants to try or make a day trip from Barcelona. We are sure you will enjoy your time in this amazing city. Barcelona El-Prat is a hub for Vueling and Level airlines. You can check the prices of international flights to Barcelona with CheapOair. The Aerobús offers direct transfers from T1 and T2 to the city centre at Plaça Catalunya. Barcelona has accommodation options for every budget from Hostels, to apartments and hotels rooms. Barcelona looks like a fantastic destination for kids and adults alike. I love a good bike tour, especially on designated bike paths. The harbor tour on calm water seems like a great way to sit down and let the city come to you after a busy day of exploring. Thanks for sharing this colorful and informative list. Barcelona is a fabulous city. It’s great to know it kid-friendly too. The building in the Park Guell photograph looks like something out a fairy tale? Barcelona is indeed beautiful and kids friendly. The Gaudi Park is really cute too! Officially added the Mont Juric cable car to my list of places to see on my first visit to Barcelona this Fall. The views look fantastic! I’m also a big fan of city cruises so I’ll add that too. I’m curious what your kids liked best! The thought of family travel excites me. Even though I don’t have children yet the idea of planning a family trip is getting name all giddy. Barcelona has been on my list of places to visit ever since college, just never got around to it. A lot of these locations and activities would be good for non-family travelers, I could imagine a few of these being good for dates ? Thanks for the post! Looking forward to reporting back once the babies are out and about traveling! We just took our twins to Lisbon, and they really enjoyed it. Next trip is set for Barcelona–hoping we are able to use your list as a guide. How long was your trip for? How many days do you recommend? Neil and I went to Barcelona for the second part of our honeymoon. Would love to go back with Isla, she’s nearly three now. Saving/sharing this list. Thank you guys! I am planning with my kids. Love this. We have a couple of other similar posts on our site like this one! It is so easy to find things to do in the big cities with the kids that you end up running put of time! Thanks so much for leaving a comment and we hope you have an awesome day.